This is an illustration for the Saturday Telegrath Newspaper all about the different types of grandparents. Saturday Telegraph newspaper, this was nice as a close up of the illustration appeared on the cover of the newspaper as well as being a cover illustration on a wine section pull out. 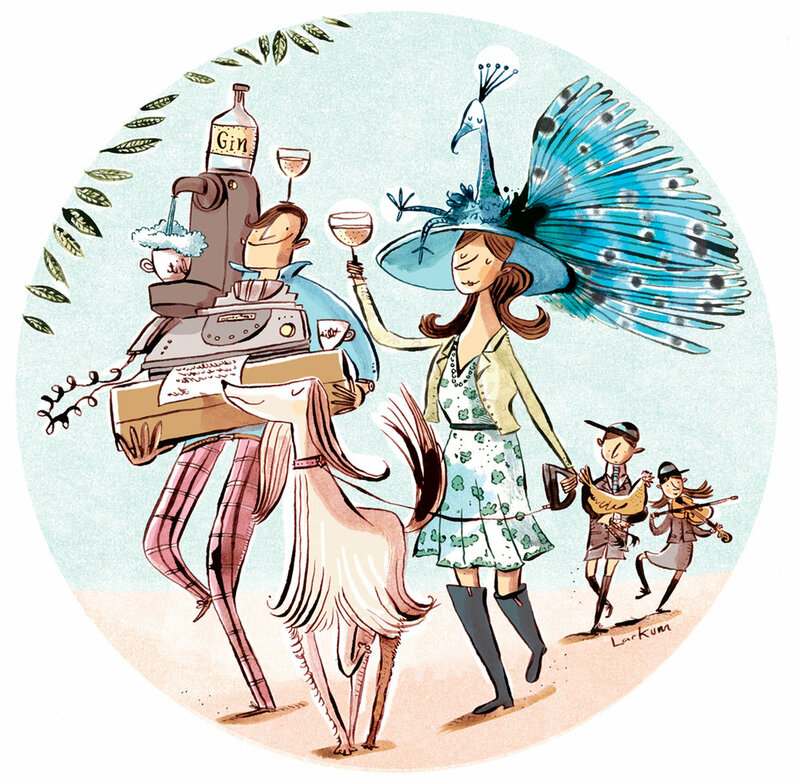 This was an illustration for a really funny article about being posh, for the Sunday Telegraph newspaper. This was a nice commission from Waitrose magazine on New Zealand wine. This illustration started out as a doodle in my sketch book. At the time I was getting commissions to do a lot of wine illustrations for the Telegraph and also the Waitrose magazine, so wine bottles started appearing in my sketch book as props. Charles Babbage, an illustration of the great scientist for a science web site which tells you which scientist you are most like after you answer a series of questions. I've been making illustrations for the Gardeners World magazine monthly for just over a year now. Each moth I get Alan Titchmarsh's new article and I play around with a number of ideas before drawing up the final colour artwork. This has been a wonderful place to develop my work and I've found a real joy in discovering all the wonderful variations of the plant world to draw. This was an enjoyable commission from The Telegraph newspaper, table tennis is one of my favourite sports to play and the article was set in France, so I used a drawing I'd made in my sketch book the previous summer holiday in France for reference. It's always a joy to get a commission from the Telegraph news paper. 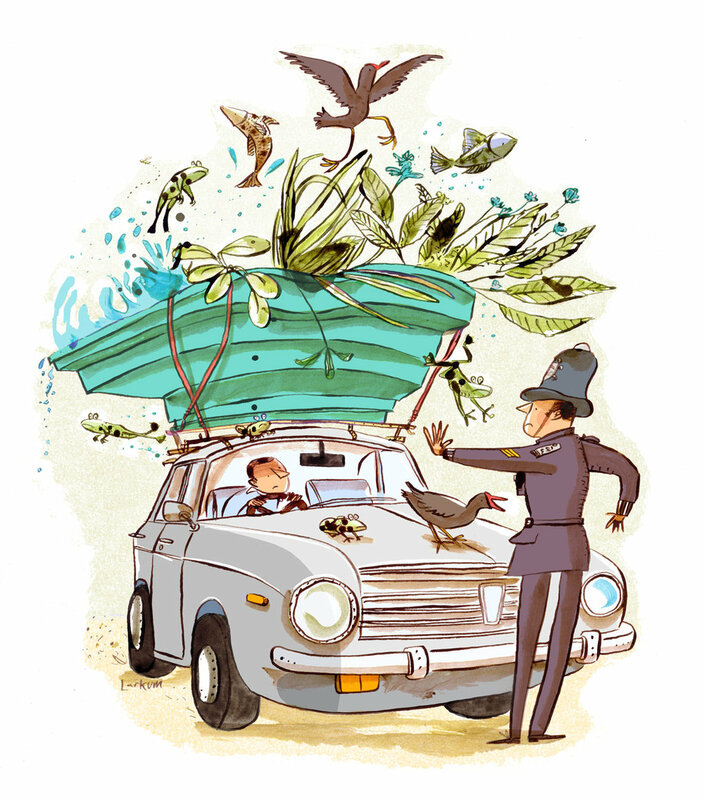 This illustration appeared in the Saturday Travel section on the 23rd June 2018. The short History of the World was a really loverly book to work on. It was good to discover it in Heffers book shop in Cambridge. I remember being taken to Heffers when I was 7 years old to see an illustrator doing a demonstration of his work. So it's a special place for me and good to see my own work there on the shelves now. My Island Biscuits design is still doing well in the shops and it's alway great to find them by chance.